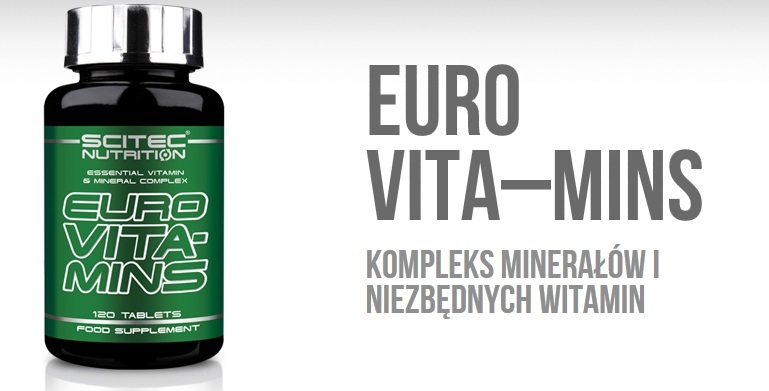 Vitamins & MineralsScitec Euro Vita-Mins - 120 tabl. 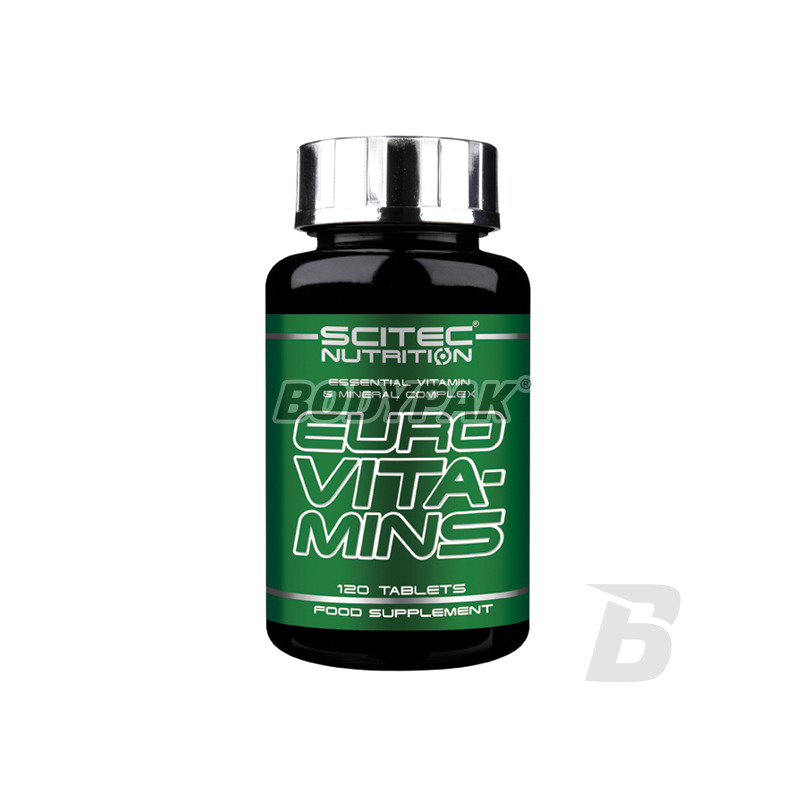 Scitec Euro Vita-Mins - 120 tabl. Advanced vitamin-mineral preparation that contains 23 essential vitamins and minerals in doses which guarantee a fast and effective supplement their possible deficiencies in the diet! 26 loyalty points Your cart will total 26 points that can be converted into a voucher of 1,04 PLN. 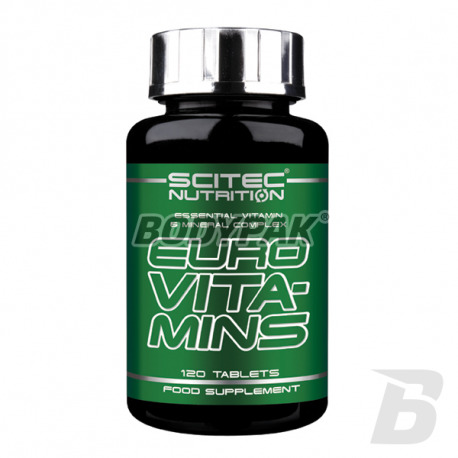 Scitec Euro Vita-Mins contains 23 essential vitamins and minerals in large doses. Among the essential vitamins, Vitamin C contributes to the proper functioning of the immune system and the nervous system, as well as contributing to reduce fatigue. Vitamin B2 helps to maintain normal vision and normal red blood cells. Included in the formulation minerals contribute to the normal fertility cycle, reproduction, and maintenance of the normal level of testosterone as well as the normal metabolism elements (zinc). Selenium helps maintain proper hair and nails, and to protect cells against oxidative stress. Coenzyme Q10 is a vitamin-like substance, which is involved in the production of cellular energy. Authorities with the highest energy requirements - eg. Heart, liver and kidneys - have the highest concentrations of coenzyme Q10. Table 2. 2 times a day. Jedne z lepszych witamin i minerałów z jakimi miałem styczność. Zawiera tylko te niezbędne składniki i w dodatku w idealnych dawkach! 7Nutrition Vitamin C 1500mg - 150 kaps. Comprehensive vitamin and mineral supplement, each serving contains the selected dose to cover any deficiency. Extremely simple and comfortable supplement with tablets. Each serving contains as many as 23 active ingredients! Put on the highest quality and enjoy better health! The formula does not contain iron. NOW Foods Pantothenic Acid 500mg - 100 kaps.